I know from experience that this is an extremely valuable opportunity for amateur pianists and teachers. I have sent many pupils to these workshops and have received nothing but raves from them. Highly recommended. Thank you so much - all of you - for a wonderful week. I feel like I was in a circle and suddenly that circle is like a star and has many points I hadn't noticed before ... so the points are expanded musicianship through singing, analyzing Bach's Inventions and Sinfonia, and the dance - a most memorable session answering questions I've had for years ... This is a wonderful program. Marcia, Deb, and Raj are the best! It was very helpful to work on some of the same pieces with all three and get their varying - although always complementary - perspectives. I found the whole group to be extremely welcoming and supportive. Nice and interesting people. Such talented and dedicated musicians, too. I'm still coming down from that delicious week of total immersion with the piano. ... The many little pointers I learned from you all during the week will stay with me for years to come. ... Thanks to you all for being you! I loved the excellent teaching. Really great! The "atmosphere" was very conducive to learning. The expectations were high which was good. Teaching from enthusiastic, very knowledgeable and supportive teachers who presented different but compatible suggestions. Outstanding. As always, you brought your love of music, enthusiasm, talent, joy, energy, and teaching insight to everyone's desire to learn and make music. So inspiring! Opportunity for depth. Fabulous experience! I'd like to thank you for a wonderful program, which I very much enjoyed. As you know, I was a little unsure about the whole ensemble thing going in, but I loved doing it and will be ready to take on the bottom or top on the next one! The group was just great - people share their music, their experience, difficulties and insecurities - we are all in the same boat. Thanks again for a memorable week of total immersion in pianoforte ... it was a little slice of heaven! I had no idea I would enjoy the experience so much, in particular getting to know all of you pianophorians. ... I am absolutely inspired to play more and better piano. I had an especially wonderful time at Pianophoria this past week, and I really appreciated your support, and the musical and practical advice about the Chopin and the Schubert. And what a great group this year! Thank you for the best week of the year. I loved every bit of Pianophoria! this year ... I found the individual lessons most helpful to me in my playing, although the practice time was a necessary accompaniment to that. And the lectures and master class were a pure joy. Where did you find such amazing lecturers? I think what I liked best was the total balance of musical engagement during the week, which made every day pass too quickly. Pianophoria! 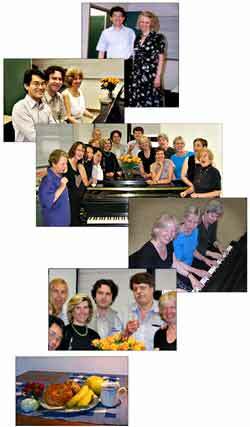 was an unforgettable experience: altogether, the intense concentration on practicing, the teachers (one better than the other), and, of course, the atmosphere — a group of people of all walks of life, different ages, different levels, and yet, all with one thing in common: their love of the piano and of music in general. I learned a lot more than just the fact that I did have the stamina to practice four hours a day. What a wonderful experience! Thank you for all you did to make it meaningful. For me, it is the coming together of people who love music, and who love people who love music, that makes it wonderful. The week at Pianophoria! was one of the best and most stimulating weeks in many, many years. The coaching, the classes, the lectures opened a totally new musical horizon for me allowing me to learn and enjoy music which until then I thought I didn't like and actually had dismissed! Was wonderful and over too soon. Thanks for everything that you do for all of us. The program is very well run. It couldn't be done better! What was especially helpful to you and to your piano playing? The distinct perspectives that each of you bring in the lessons. Very rewarding week. Thank you. Well, everything I heard, I observed, turned out to be quite considerable benefits for me, and almost every single moment! THANK YOU! I would consider about flying back even from Japan to attend another Pianophoria! week in the future. The teaching was a gift. I found myself hearing the music I've played so often in new and different ways, and even pieces I thought I was getting bored with suddenly seemed fresh and compelling. The experience was informative, fun, inspirational, fun, challenging, fun, supportive, did I mention fun? Overall this workshop was much, much more than I expected. After having worked on my own for a number of years, I was feeling stagnant and without direction. The workshop has provided just the impetus I need to continue my studies. It was wonderful to immerse myself in music for the week. I felt that I could shut off the world and really concentrate on learning, feeling and expressing music ... I must say the week inspired me. Usually I sit and practice for 1/2 hour and jump up to do the million things that could be done. Today, I practiced 45 mins and then kept stealing time from other things and practiced at least three more 15 min. periods. It didn't feel a bit too long. Don't know if this will stick but for now it's great. You, Thomas and Vladimir were a wonderful team. I asked ... how there could be three such sympathetic teachers in one place. You worked together beautifully, from what we saw. Your enthusiasm and encouragement were felt throughout the week ... I really loved hearing everyone play on Sunday. It was so touching to hear how we all were trying to incorporate what we had heard all week. Everyone seemed to overcome something in themselves to play.